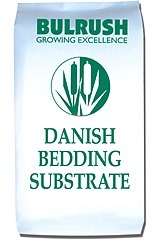 known as Danish bedding because Danish growers favour the addition of clay to increase the buffering or nutrient holding capacity of the substrate. The extra buffering helps produce a wide range of specialist crops. Specific mixes for salt sensitive plants have also been developed from this range i.e. cyclamen and primroses.